*The Annual Percentage Yields (APYs) are effective February 01, 2019 and are variable and subject to change without notice and may change after account is opened. 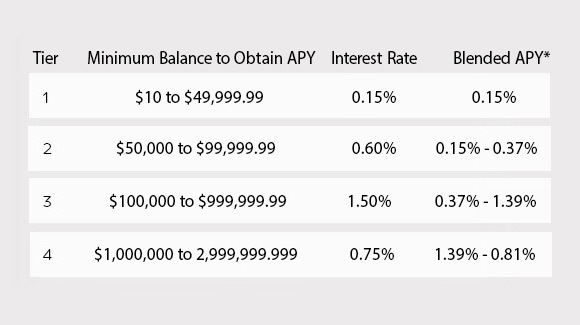 An interest rate of 0.15% will be paid only for that portion of your daily balance that is less than $50,000. The annual percentage yield for this tier will be 0.15%. An interest rate of 0.75% will be paid only for that portion of your daily balance that is greater than $50,000 and less than $100,000. The annual percentage yield for this tier will range from 0.15% to 0.45%, depending on the balance in the account. An interest rate of 1.75% will be paid only for that portion of your daily balance that is greater than $100,000 and less than $1,000,000. The annual percentage yield for this tier will range from 0.45% to 1.62%, depending on the balance in the account. An interest rate of 1.00% will be paid only for that portion of your daily balance that is greater than $1,000,000. The annual percentage yield for this tier will range from 1.62% to 1.00% depending on the balance in the account. A service charge of $5.00 will be charged each monthly statement cycle. The monthly maintenance fee will be waived if you maintain a Reading Cooperative Bank Checking Account with a minimum of one transaction (deposit or withdrawal) during each monthly statement cycle. One account per customer. Fees and withdrawal may reduce earnings on accounts. The minimum daily balance tiers to earn the APY stated on this rate page reflect the full tier balance ranges for each appropriate tier. Reading Cooperative Bank reserves the right to limit balances. Transaction limits as set by law apply; please see account disclosure for more information.